First off, I'm baking tonight. SOMEbody decided to have his 50th birthday tomorrow. I still don't really have any great ideas for decorating his cake (no over the hill stuff--it's passe. Plus all that black frosting stains everything, especially my tongue) so if you have any brilliant ideas I would love for you to share them with me. 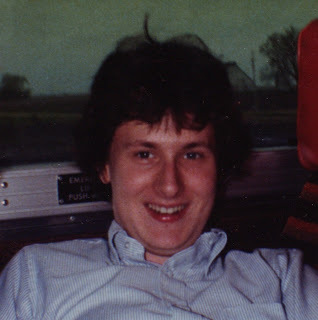 I realized this afternoon that Jim is lucky because he got to wait an extra day to turn 50. Normally his birthday is the day after Feb 28th but not this year. Someone squeezed a Leap day in here just so Jim could enjoy an extra day of being in his 40s. 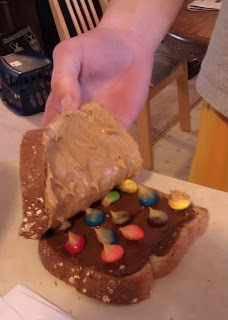 In other news, Paul invented a new sandwich, which I had to share with you. In my opinion it is nasty, but he seemed to like it. I like the ingredients individually, but when he put them all together I felt a little queasy. I know Valentine's day has come and gone ages ago, but I have to post something or my posting skills get rusty after a week of no use. I spend so much time waiting for letters and emails from the missionary that I don't get my blogging done like I used to. Around Feb 1st every year, I start wondering why I put myself through this stupid Valentine tradition. But then the morning of the 14th, as Hayley and I headed out to seminary, she said, "treasure hunt?" and I thought, "OK, I'm glad I did it." 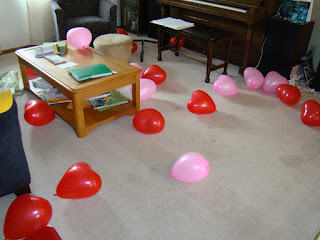 Three of the balloons had little pieces of paper with letters on them. Matt tried this method of determining the letters in his balloon. Hayley and Paul both popped their balloons. Unfortunately, that tended to send the little pieces of paper in all directions. Here is Hayley unscrambling her letters so they read "Fork knife spoon." We'll be singing the Blues this summer--Cougar Blues. Paul was accepted to BYU Provo for summer semester. He came home from work, walked into the basement while texting, grunted hello. Said work was sporadically busy and sporadically not busy, logged onto the computer, checked something out (I didn't know what at the time because I was engrossed in "Downton Abbey"), and then he mumbled, "oh, I got accepted to BYU for summer." He was so low-key about it that I didn't know what he meant at first. And he didn't specify which BYU either, although I guessed Provo because I already knew that BYU I had accepted him. We've just sent EJ away a week and a half ago, and now we are sending Paul away in 4 months. I kind of feel like there's a brick wall somewhere, waiting to come smack me in the face. These kids and their growing up! How did they manage to do it so fast? Matt had a project for math class due last week. It was called the Paul Bunyan project. They had to make a model of something and scale it to Paul Bunyan proportions (which I don't know the exact ratio). Hayley had to do the same thing two years ago, and she chose to do a dental floss container. Matt originally chose to do a CD, but the final size of the project would have been nearly 7 feet tall and wide. 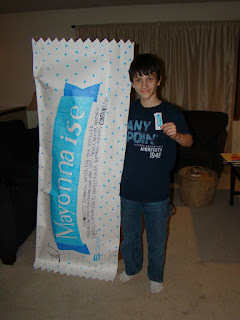 He finally settled on doing a mayonnaise packet--the kind you find in restaurants. Before I talk about Frank, I will give a quick update on life after EJ. We're doing fine. Of course we can't wait for the first letter, which probably won't arrive for another week yet. Our church pew seems very empty without EJ sitting on the end of it. But we're fine. And I've only teared up once, and that was during the opening prayer in church this morning when the person giving it (Elder W, one of the missionaries serving in our ward who EJ spent a lot of time with) said, "Bless Elder Evans in the MTC." I really wished I had a kleenex in my purse (they always disappear) so I could wipe away the stray droplets. EJ's first name is now Elder. Some people EJ invited over for dinner his last night here. The guy on the left is a former missionary who served in our ward for 14 months. 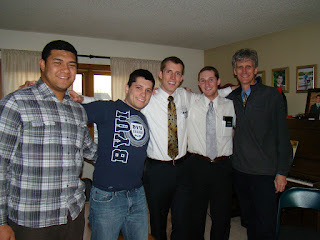 He was the first missionary that EJ really got to be good friends with. K is from Tonga and after his mission, he moved back here to our ward. He loves it here and we love him. He came to our house for dinner his first night in MN as a missionary, and I served pork loin and K said it made him feel happy. Pork is a celebratory food where he was from and it made him feel like he was celebrating. These next two pictures are from nearly twelve years ago. They probably won't see each other for four years. I'll post something non-EJ or church related. Yesterday was a refreshing day of few commitments. I made dinner but few people were at home to eat it. 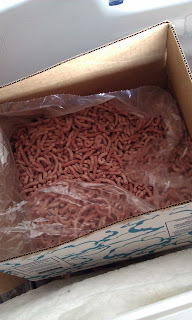 Yes, it looks like worms. It weirds me out every time I look at it. But we ate the chili anyway, those of us who were at home. A couple days ago, I got a hankering for really good bread. Not plain old sandwich bread that I buy at the store for $1.39, but stuff that I have to go to a bakery for and pay a few dollars more. I could just bake some myself, but with getting EJ ready for next Wednesday, work, and seminary prep, I frequently make excuses not to bake, let alone cook dinner. I thought to myself, "I really want to go to a bakery to get some fancy bread. But I never leave my house anymore, except for seminary and that doesn't really count because...I don't know why it doesn't count, but it doesn't." So I've been traipsing around the house for a few days thinking about bread and how and when to get some. Then on my way to seminary this morning, I realized that there's a Great Harvest Bread Company within a mile of the church. Jim came in from moving the truck out of the driveway so I could drive to seminary, and he said, "It's foggy out." I thought, yeah yeah. Fog. Whatever. So I got in my van and started down the road to the church. I drove along and drove along (no that's not a typo, it's my love of fairy tales peeking through. As in whenever we told stories to each other, there was always and phrase, "she went along and went along" meaning she walked for a time) I did note that the fog was more foggy than usual. But I was seeing other cars and I could see stoplights so I was fine. I drove for a bit more and saw a stoplight ahead. I thought to myself because no one else was in the car and I don't have to vocalize to talk to myself, "Ah. Here is the stoplight at county road 5. I will turn right here."